Q: What about warranties after pool completion?!? We’ve got you covered there too. Firstly, all of the warranties are provided – by Arizona consumer law – from the various ROC licensed subcontractors for their craftsmanship, and from the various name-brand equipment manufacturers for the components they sell. LMR acts as your continuing liaison afterwards to these people for the full time period of each warranty (two years and upwards depending on the item category). You call us – we call them. It’s part of our service. 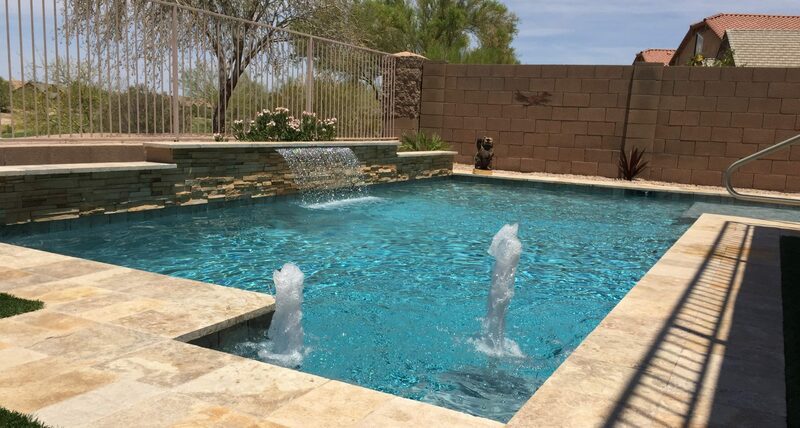 Many “retail pool contractors” try to disparage or “badmouth” the Homeowner/Builder approach by planting doubts and suggesting bad outcomes will result because a pool contractor isn’t involved. Fact is, because of the LMR Owner Assist Program, you’re never alone and never have to guess at the answer. LMR is always just a phone call away and will help you ON SITE at each step of the process. And the work? It’s likely the same guys that the “big name” pool contractors already use… and are likely even MORE experienced than some of the newer hires at “the big name firms”. We recommend only the finest of qualified sub-contractors to bid on your project – many of which are already “subbing” for the exact same pool contractors who like to tell stories about the down side of our program. In actuality, these pool industry sub-contractors prefer to work on an LMR-consulted project because they get paid what they’ve bid and much sooner than through the big companies who are quick to get your money, but are often slow to let go of it in paying the “subs”. As a result, you will have happy, cooperative workmen on your site who respond to your input and questions with courtesy and promptness. Q: How long will the project take to complete? Most LMR projects are completed within 30 days from engineering design approval and issuance of a city building permit. Unexpected delays can occur (like monsoon rain-outs), but due to our careful planning and frequent contact with the subcontractors, these are rare. Q: Hey, I have to work for a living! Do I have to be home for the pool workmen to get going each day? Short answer – NO. Most of our working clients trust us with access to their rear yard via the side gates. Remember, these pool building guys are licensed and insured pros, and LMR will make certain your site is carefully inspected every day for safety and security. No access to the interior of your home will be required. Just plan to keep “FIDO” under control and secured so the workmen don’t frighten him. But… you are welcome to actively supervise whenever you’d like! It’s your home – you’re the “contractor”. Q: Do I pay the sub contractors directly? Yes. And because they will get paid upon completion of their individual tasks, instead of the 30-60 day delay they experience with typical “retail companies” until after project completion, you’ll find the subs work more efficiently and quickly than with the other guys. That means your pool will be completed in a shorter timeline with happy workers on your site. But you will need a stack of checks on hand ready to go! Things move quickly once the building permit is issued, so financing must be arranged and in place before permit is issued and excavation begins. Then be ready to see things happen fast! Q: Can the project be financed or is it cash-only? LMR maintains contact with funding specialists who can help you finance your project. Typically, the home owner arranges their own financing (home refinance, 2nd mortgage, signature loan, etc.) and then coordinate for a project funds dispensing plan either by holding the cash until required and writing checks themselves, or with a trust and disbursing relationship with a financial institution who can issue checks directly to the subcontractors. LMR does not ‘collect and hold’ your money in advance to be distributed to others later. NO Owner-Builder CONSULTANT can lawfully propose such a plan. Typical retail contractors make sub-contractor payments for the separate tasks from the much larger fees they collect in advance from you. We think you’d appreciate saving the difference for yourself instead. Q: How does LMR get paid? Your project costs will include a separate delineated consulting fee paid to LMR at the start of the project along with your acceptance of the design and cost bids. Any other checks paid to LMR will be for reimbursement of equipment purchases or vendor service fees paid by us on your behalf (i.e. filtration and pump equipment, cleaner equipment, engineering certification fees, city construction permit fees, etc.) LMR will provide a complete breakdown of each charge beyond its consulting/design fee and will provide documenting evidence of those fees to your satisfaction. Q: What about startup and continuing service after the pool is built? LMR includes in their project charges list a complete site cleanup and pool startup service fee. Your pool will be turn-key, water-in-the-pool, swim-ready with no mess left behind. After startup, we can refer you to qualified pool service technicians in your area who can continue monthly service thereafter if you wish. Most of our clients become so thoroughly oriented to their pool equipment that they feel confident to take care of their own pool. But if needed, LMR is happy to field your questions and get answers for you. Remember, your warranty is in effect on everything for at least two years, and some items (like the filter pump) for even longer time periods after completion! A better way to build a pool.